As a Life Plan Community, we allow “planning” and “living” to merge. Having a plan in place—the security of the safety net provided by the availability of healthcare, coupled with the freedom from not having to manage all the day-to-day tasks that come with homeownership in a senior living community—allows residents to live life to the fullest. Whether you are looking for spacious Townhomes or Independent Apartments, Cedar Crest offers worry-free options for people aged 55 and better that are ready to transition from owning a home. If advanced health services are needed, residents have peace of mind that that they have priority access to our full continuum of care. Cedar Crest’s faith-based, person-centered approach is evident in every area of our community. Which senior living option is right for you? Come and see the Cedar Crest difference! You can live more and work less in our townhomes. Our spacious, maintenance-free homes are an ideal choice for active adults that want the comforts of home without the hassles. Residents enjoy regular sightings of wild turkeys, deer, and other wildlife along the Rock River valley. Townhome residents also have full access to all of our independent living amenities and activities. Our floor plans range from 1200 to 1800 square feet and each unit is unique, which makes our community distinctive. The future is bright in our maintenance-free independent apartments. With over 30 different floor plans that range from 550 to 1600 square feet, we are confident that you will find the perfect fit. Residents have the freedom to enjoy a robust activity schedule and all of our amenities. Apartment residents are also able to access support that includes housekeeping, laundry, meal delivery, medication management, and other scheduled services as their lifestyle changes. 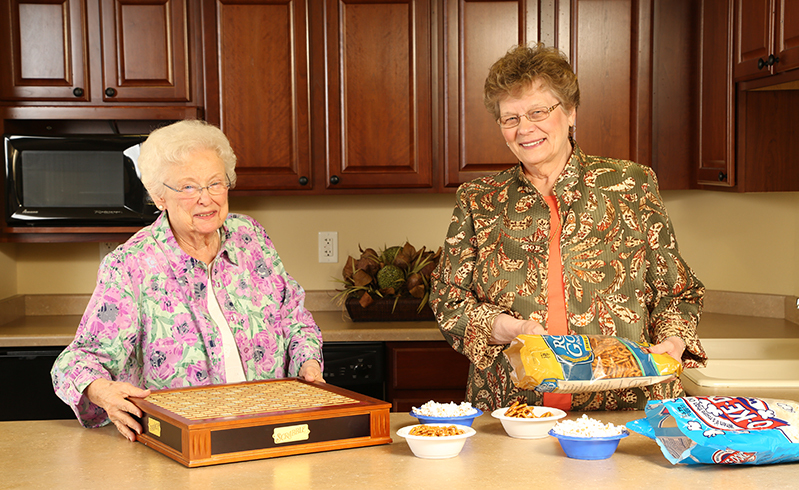 In the Assisted Living studio apartments, Cedar Crest’s experienced healthcare professionals work with each resident to develop an individual care plan. Each plan includes 3 chef-prepared meals and snacks, medication management, assistance with activities of daily living, housekeeping, and laundry. Daily activities include games, discussion groups, Bible studies and more. Caring for those with dementia requires patience, compassion, and special training. Our dementia specialist provides adapted programming that engages our residents with where they are at; incorporating daily music, adapted activities, crafts, and games. Each resident enjoys the comfort and privacy of their own room with individual temperature controls. Daily care includes 3 chef-prepared meals and snacks, medication management, assistance with activities of daily living, housekeeping, laundry, and round-the-clock staffing. Our health care center is designed and staffed to provide an independent, home-like environment where residents can live with dignity. Whether your loved one needs short-term rehabilitation or long-term care, you can be assured that our community will promote emotional, physical, social, and spiritual well-being. Our patient-centered care model has been rated 5 out of 5 stars by Medicare.gov.